There are kitchen gadgets, and then there are expensive and technologically advanced kitchen gadgets. And then there are these three products. They perform feats of kitchen magic previously unimaginable. And they cost, well, a lot of money. Are they worth it? That’s for you to decide. According to its legions of fans, the Thermomix is the most all-purpose, convenient and precise countertop kitchen gadget available anywhere. Except it isn’t available anywhere — most conspicuously, it’s not sold in the United States. The Thermomix weighs, mixes, blends, purees, chops, stirs, grates, grinds, processes, kneads, slices, peels, cooks and steams food, controlled by computer and reportedly with incredibly professional results. In fact, it’s used by chefs in some restaurant kitchens and pastry shops. The main processing space is a 2-quart stainless steel container with blades built in. It’s controlled by a series of buttons on the front. Some like the Thermomix for the appliances it renders unnecessary, saving counter space. But others point out the things it can do that other devices cannot — for example, mix and cook at the same time. 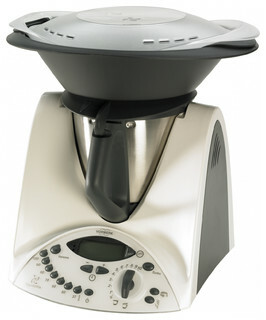 The Thermomix has a cult-like following among home cooks and professional cooks alike. And it can save a lot of counter space — if you can get one. Prices vary by region.